MSNBC’s town hall with Donald Trump was disgraceful. The media’s coverage of Trump has been soft, insufficient, and without substance. 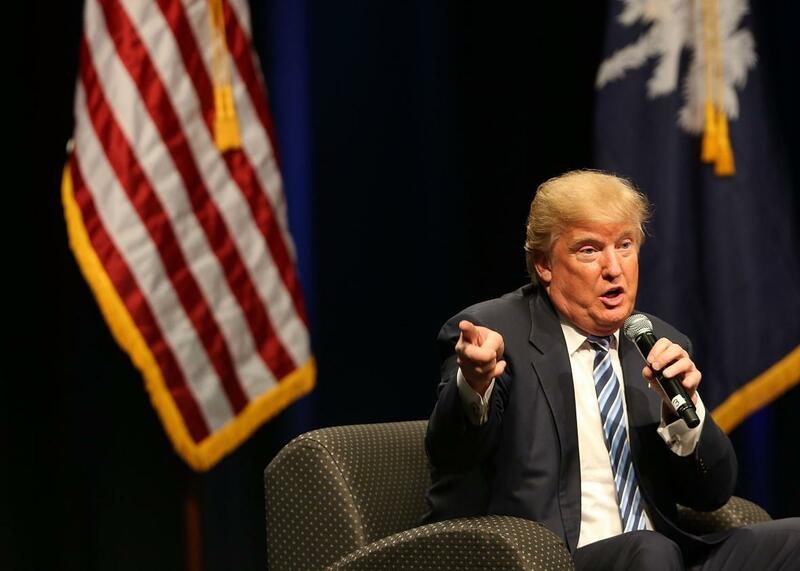 Donald Trump on Feb. 16, 2016 in Beaufort, South Carolina. Is Donald Trump in trouble? After facing hostile questions from Joe Scarborough and Mika Brzezinski Wednesday night—they comprehensively laid out his flip-flops, presented him with damning videotape, and asked him to explain the inconsistencies in detail—Trump was confronted by hostile audience members at MSNBC’s televised town-hall forum. When a Muslim questioner got up to ask why he had said such bigoted things about minorities, Trump seemed to struggle while Scarborough forced him to respond. The candidate looked uncomfortable, unhappy, and somewhat lost. It could be a turning point. If only. Of course, none of this actually occurred Wednesday night, just like it hasn’t occurred once this entire campaign season. Instead, Scarborough and Brzezinski hosted what appeared to be a rehearsed and “safe” town hall, in which American voters asked the candidate such hard-hitting questions as “Why did you decide to run for president?” and “how will you set yourself apart” from other Republicans? It was completely worthless television, except in one sense: The program highlighted the many ways in which the media’s coverage of Trump has been soft, insufficient, and without substance. Scarborough began the evening by noting that he and his co-host were prepared to debrief Trump and ask him important questions; instead, the questions were mild, and the follow-ups nonexistent. It remains shocking that after months of bigoted comments and almost pathological dishonesty, Trump still lands these types of interviews. Wednesday night, there was no mention of his racist comments toward Mexicans; his praise for Russian President Vladimir Putin; or his stigmatization of Muslims. He wasn’t pressed hard for any policy details, nor challenged about his well-catalogued dislike of the truth. Scarborough began by asking about—what else—polls, before ostensibly turning to the Supreme Court. After asking one question about the Second Amendment, which Trump dodged, Scarborough moved on. (Scarborough’s constant grinning at Trump’s laughable dishonesty was the only suggestion that the host recognized the nonsense Trump was spewing; he simply didn’t care.) When Scarborough had a chance to follow-up on Trump’s nonsensical answers—guns, health care, etc.—he usually just changed the subject. Scarborough fared slightly better when the discussion moved to Iraq; he briefly focused on Trump’s continued (and unproven) claims about opposing the war before it began. But then the questioning was turned over to the audience—Brzezinski was basically superfluous—with the first question going to a woman claiming to be a Democrat who had nonetheless learned a lot from Trump’s great business teachings. Terrific. If the softball questions weren’t enough to make you feel like you were watching a rigged entertainment program, everything else about Wednesday night’s event also had a ring of cynicism to it. CNN was hosting a “town hall” in South Carolina with several of the other candidates, and MSNBC clearly wanted to compete. They did so by managing to get the biggest ratings draw in the race to appear with his favorite hosts. (Trump often appears on Morning Joe.) It’s true that there have been moments when Trump and Scarborough have gotten tense with each other, but it has always been papered over, presumably because it’s in both of their interests. MSNBC has certainly not been uniformly easy on Trump, especially during its evening programs. But the networks’ reliance on his ratings—a problem that is especially acute at CNN—means that they need to maintain a certain amount of politeness when dealing with the real estate magnate. If there is one takeaway, it’s that the media’s relationship with Trump should worry Hillary Clinton, assuming each of them vanquishes their primary opponents. I would have said six months ago, perhaps naïvely, that a blatantly bigoted candidate would face such a sustained media firestorm (especially in liberal precincts) that he would be incapable of getting elected. That’s not yet the case. Indeed, there are no signs that the media’s sick, interminable honeymoon with Trump will come to an end anytime soon. Which means that rather than witnessing the beginning of the end of Donald Trump’s time in the political spotlight, we may not even be at the end of the beginning.